Description of "Cognitive Drill Therapy"
Cognitive Drill Therapy (CDT) is developed by Dr. Rakesh Jain, Ph.D. Clinical Psychologist, specifically for the management of phobia and obsessive-compulsive disorder (OCD). It is a structured, directive and collaborative form of psychological treatment based on theories of conditioning, cognitive appraisal and linguistics. Dr. Rakesh Jain, Ph.D. Senior Clinical Psychologist has developed a novel form of psychological treatment for efficiently addressing Phobias and select cases of Obsessive-Compulsive Disorder (OCD). Cognitive Drill Therapy (CDT) is an outcome of his more than ten years dedicated efforts to develop innovative procedures to deal with various anxiety conditions. Currently, he is actively involved in applications, teaching and research on cognitive drill therapy specifically in phobic conditions. He conducts training workshops filled with on-the-spot demonstrations of the efficacy of CDT in anxiety disorders. He has so far conducted workshops on CDT in (a) Regional Institute of Education, Bhopal (b) Department of Psychology, Digamber Jain College, Baraut, U.P. (c) Psychowaves, Chandigarh (d) for MSKB College, Muzaffarpur , Bihar. He has co-authored three publications on CDT in Psychology Journals. Also he has drafted a manual for Cognitive Drill Therapy. This book is intended for both the therapists treating phobia and OCD and the persons affected with these conditions. Reviews of "Cognitive Drill Therapy"
Amazing Therapy developed n India by an Indian. Something we offer to the west. 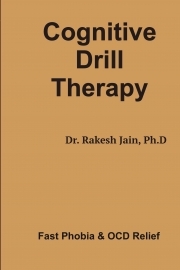 Cognitive Drill therapy is a bulldozer technique as the author and developer of the therapy Dr. Rakesh Jain points out. Most common problem therapists face in India is that patients ask for quick reliefs and most of the patients are apprehensive of long therapies where they end up paying lot of money pr sessions. Hence we have patients dropping out of treatment mid way in the therapy. CDT is short term quick acting therapy for most cases of Phobia and OCD. The book is basically a manual and a guide to learn all that there is about the therapy. It is easy to practice and a therapist can equip the patient with the drill thus enabling him to use it in he moments of panic and stress when behaviour occurs. Best part is the book contains a little bit on CBT too. Lastly it explains anew approach of therapy Recovery Focused Behaviour Therapy. Combine it with Cognitive Drill Therapy and you get amazing results. Dr rakesh Jain is a pioneer of this therapy and although nothing can replace directly learning from him and watching him performing this therapy but this book comes really close. I would highly recommend it to the serious professional therapists to buy and add it to their book shelf for ready reference. A must buy for anyone practicing and working with patients with phobia and/or OCD. As a psychotherapist, I feel empowered to have read this book. This is a boon for numerous sufferers of the debilitating disorders OCD and Phobia across the world. Written in a lucid manner, the book outlines the scientific principles of this new therapy, researches, case studies and also the stepwise protocol of the treatment. The book gives extra value to the reader, as other established therapies likd CBT and some useful tips for treatment are also included. The icing on the cake is the chapter on latest therapy, Recovery Focused Behaviour Therapy. I highly recommend the book to psychiatrists, medical practitioners, psychologists as well as people suffering from OCD and Phobia, their friends and family members. It gives me immense pleasure to review this historic work. Historic because this book will change the way in which phobia is perceived in the world. Through this book the author has very smoothly transferred his own original insight of treating both phobia and OCD which he gained through his own vast experience in clinical practice. The success of this book lies in the fact that the therapists who have long struggled to treat these painful conditions become empowered by going through the book and learning the stepwise protocol of treatment , so explicitly outlined in the book. It is a blessing to the numerous sufferers of these disorders , whom relief and cure have evaded till now. I myself feel more confident of taking up these cases for treatment in my clinical practice now. My gratitude and highest recommendation for the book.